Bruno Mars is the stage name chosen by American Singer/songwriter, Peter Gene Hernandez. He was born 8 October, 1985 in Honolulu, HI. Growing up in a musical family, Mars began performing at an early age. He won a Grammy for Best Male Pop Vocal Performance with his single, “Just the Way You Are”. Here, we shall be taking a look at Bruno Mars hairstyles. Bruno is a man who prefers to keep his hair short. For casual wear, he allows his natural curls to take over. He gets the hair cut short on sides and back with the top layer a bit. This creates texture in his hair that does not require any product to maintain. More formal occasions cause him to straighten his hair. He still has the sides and back cut short and top layered for blending. However, because his hair is longer when straightened, he has it flipped toward the back of his head. This gives it some height due to the natural body of curly hair. A small amount of pomade can help him achieve a wet look and a gentle hold. When he straightens his hair, he is able to create a Pompadour that is reminiscent of the styles made popular in the 1950s. He has the option of using hair cream or gel to get a sort of greaser look or simply using pomade to provide a soft hold that ladies love to run their fingers through. How to get this one? Leave the upper part as it is, creating layers and is left to be blow-dried as for the back and sides, simply ask your barber to cut it short. These Bruno Mars hairstyles are very similar in cut but have very different appearances. His hair has a great deal of natural curl to it. When he lets his hair go, this curl provides him with an excellent casual look. Application of straightener makes his locks stand out farther from his head and gives him the opportunity to slick his hair back. 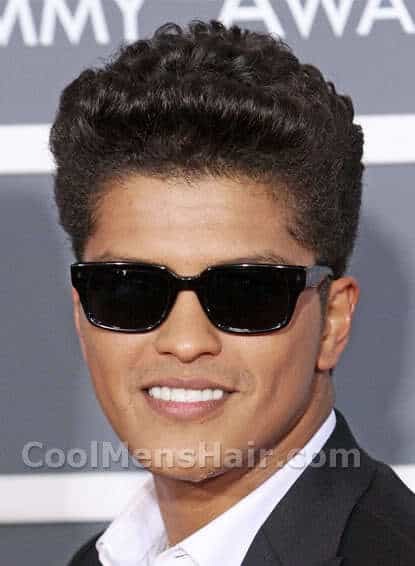 We have also seen Bruno Mars play his short formal cut to get the complete retro look matched with glasses. So if you are wondering which of Bruno Mars’s hairstyle would go best with you, here’s our advice that will help you decide. Firstly, it depends on the shape of your face, the faces that are round, oval, heart or triangular shaped all have chances of turning heads if they are able to carry out both of Bruno Mars’s haircuts with confidence and perfection. Secondly, you would want to consider your hair texture as well. It is advised that you try out Bruno Mars’s hairstyles if you have thick hair. If your hair is on the thinner side, the slight pompadour may do the trick perfectly. how much hair does bruno mars have cuz it looks like he has more hair on the last pic and a litle bit of hair on the second pic and regular on the first pick. LOLZ! PLZ TYPE BACK CUZ IM SWEET. LOLZ! LOLZ! LOLZ! LLLLLLLLOOOOOOOOLLLLLLLZZZZZZZZ! WAAAAT. YA. YUPS. WAT UP. WEAD. -ALLL OF THOSE R MY CATCH PHRASES AND IM ONLY 11. LOLZ!